Tuesday night Costa Mayor Pro Tem Jim Righeimer and Planning Commissioner Rob Dickson debated Righeimer's Charter with Councilwoman Wendy Leece and retired former Costa Mesa Planning Executive Perry Valantine in a 90 minute event moderated on radio station KOCI-FM, 101.5 moderated by hosts Troy Davis and Steve Ray. The event will be available for future listening by mid-day Wednesday at www.kociradio.com. Initially I had planned to do a running commentary as the event progressed. Very shortly I realized that I couldn't do it because I would have never been able to keep up with the fabrications, misdirection and smoke being blown at the listeners by Righeimer and, to some extent, Dickson. So, I just took copious notes and will try to give you a feel for the event now. The hosts asked six questions of the panel. The order of speaking was chosen by lot. Each was given 2 minutes to respond, 2 minutes for a rebuttal and 30 seconds to respond to the rebuttal, if necessary. Each gave a 2 minute opening statement and a 1 minute closing statement. It actually went pretty well. Only once was a speaker interrupted - Righeimer just couldn't keep his yap shut. I'm going to paraphrase most of the comments except where I was able to accurately capture a quote. In the opening statements Perry Valantine led off and told us he found the Charter a rather confusing document. He said that it is essentially a contract that the voters are being asked to sign without all the blanks being filled in. He pointed out that it fails to follow the recent "anti-Bell" law that requires the new powers being bestowed on the City. The ballot description does not do that. (You may recall that a special meeting was called by contract City Attorney Kim Barlow to do some "language clean up" that resulted in the reference to no-bid contracts being specifically deleted). He compared the Charter to buying a new car but leaving it up to the dealer to decide the kind of car. 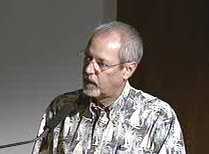 Rob Dickson expressed frustration with the process. He said he viewed this charter as "emancipation from Sacramento" - a phrase he would repeat frequently. He said the charter is a good basic framework and that it protects the citizens. He said citizens elect leaders, retain the power, can recall council members. He said we will have the power to hire and fire, to take control back and make our own financial decisions. He said that if we had been a charter city the 3%@50 pension would never have happened. Troy Davis asked the first question: What is your primary reason for support - or non-support - of the charter? Righeimer took this one first and began by saying, "I'm obviously supportive. It's an excellent charter." He went on to state that it's a framework to handle our finances and that he's tired of having to pay $41 per hour to a stop/go sign-holder. (That's become part of his mantra lately) He said we can't outsource unless we get permission from the employees. He again said that 60% of the charter follows General Law. Leece said she's all for saving money and that outsourcing may be one way. She expressed concern about accepting lower quality if we outsource, particularly in public safety. She mentioned that the CMPD staffing is down to 131 and that crime is up and worried about how we balance keeping our residents safe and still save money. She encouraged folks to read the charter - it's only 9 pages - particularly Section 103 concerning the power bestowed on the council. Valantine said he's "not opposed to the concept of a charter, that after 60 years since incorporation maybe it's time for us to think about it". He's just not for THIS charter, due mainly to the process, lack of sincere community input, insufficient definitions of powers and the issue of no-bid contracts. In his rebuttal Righeimer said it's "the same old stuff" and complained that people didn't do anything about if for 25 years. He said "There's not really complicated issues here." Leece said it DOES NOT address pension reform. Dickson said the citizens will participate in pension reform. Valantine said he was "trying to decide if we're all reading the same charter". He said it doesn't have anything to do with current pensions. Steve Ray asked question #2: What provisions of the charter are essential? Leece led off by complaining about the process. She said it should have involved a study session, with legal advice to keep us out of trouble. She referred to the recently-deceased Ray Watson who helped develop Irvine, whom she described as a visionary who valued input from the public. Righeimer dismissively said, "I don't know where to go with that. Costa Mesa is not Irvine." He then launched into what would become a major talking point - that "labor unions are spending a half-million dollars to defeat the charter." Referring to Leece and Valantine, he said, "As nice as these two people are over there, it's all about the money." Valantine expressed concern about Section 103, which he paraphrased as meaning "even if we don't list it here we can do it." He pointed out that contract levels can be set by resolution - a much looser standard than using an ordinance. He expressed concern that the charter dodges portions of the state code designed to "eliminate fraud, corruption and favoritism." Dickson again used his "emancipation from Sacramento" chant. He said it is "actually a great charter" and went on to state that "we are allowed to choose who we contract with" and "we can set the limits" and mentioned Section 401c. He said the "language of the charter governs" (which is one very scary fact). He said "None of it is the crazy sort of fraud and abuse." He liked the section that eliminates "the ability of unions to take contributions out of paychecks." In rebuttal Leece said that Rob is correct - residents can comment on pensions but the charter does nothing on pension reform. Righeimer said, "It's really simple. Why is a half-million dollars coming from labor unions out of Sacramento?" Davis asked the third question: He said the some folks who oppose the charter say it's a plan to bust public employee unions and asked for the panelists thoughts. Righeimer denied the charge, saying, "First of all it's not about busting anything." He then went on to list factors he finds so onerous about the public employee contracts - pensions, sick pay, vacations. He complained that Newport Beach has better looking parks than we do and thought we can do better by outsourcing. Leece said we're not talking apples and apples. She agreed that using the lawns and medians in Newport Beach is a good comparison, but trying to compare our jail to others is not. She complained about the hasty process that issued layoff notices before ANY studies were done. Dickson said the charter was done to save money, not bust unions. He complained about the employee associations inserting themselves into political activities and referred to the law firm that represented the police association until very recently as "unethical and illegal". He referred to the recently adopted COIN program. Valantine said, "I'm not inside anybody else's head" and compared recent actions in the city to those in Wisconsin. He described them as attempts to "disempower unions". He said that it "seems that getting back at the unions is in the author's mind." he acknowledged that we can probably save money by some outsourcing - that "we've done it for years." He said there is more than dollars involved, mentioning quality of work, institutional knowledge. He expressed special concern that we lose a great deal in Disaster preparedness, citing that employees are, by law, part of disaster preparedness. In his rebuttal Righeimer haughtily dismissed Valantine's concern, saying we can just "make disaster preparedness part of a contract". He said "employees won't come here from San Clemente" during a disaster and that Newport Beach "keeps institutional knowledge by managing." Leece expressed concern about losing institutional knowledge. Dickson said, "Unions should not have a bigger seat at the table than the residents, but they do. ", then mentioned that half-million dollars again. Valantine wondered that, if the unions are really that powerful, why do we have four anti-union council members? Question #4 was posed by Steve Ray. He said it has been theorized that the Charter would reduce spending. He asked if it was true, and how much? Leece took this one first. She said that she was "sure outsourcing would lead to savings if we didn't have to pay prevailing wages" and that she was willing to look at that. She said that Huntington Beach and Newport Beach both DO pay prevailing wages. She said we have our financial house in order and that the pension issue can be resolved in a calm, thoughtful manner. We can ask our employees to pay more of the burden but that we've not been able to sit down with some of them lately. Valantine acknowledged that some outsourcing makes sense, but it should be balanced. He worried about low ball contracts and expressed concern that we might accept one of them and then sell our equipment, only to find the contractor cannot perform. We'd be left without good options. He discussed the heavy-handedness of the outsourcing process 18 months ago and the lawsuit appeal that's pending, indicating that the council pushed the employees into a corner by violating it's own rules. Dickson said we have the ability to outsource everything, then said one of the "fear tactics" used is poor quality. He also said "collaborative negotiations didn't work two years ago". In rebuttal Leece said "we all want to save money but that we've alienated our employees and residents". 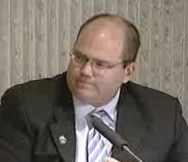 Dickson said he was at the meeting in 2010 and described the council members as "begging". Leece pointed out that the lack of a threshold dollar amount is one reason this is a weak charter - that we didn't do our due diligence. She said that section is vague because it was rushed and that it can lead to friends being handed large contracts. Dickson bemoaned the fact that this has become an issue and echoed Righeimer's concern about the cost of putting jobs out to bid. Valantine said the rules don't apply to friends and frat brothers and reiterated the need for a specific threshold number. He said the charter exempts the city from all California statutes regarding bidding and purchasing and mentioned that other cities included protections in their charters. Righeimer's rebuttal was strange and telling. He said, "It's offensive to me that we're wasting our time talking about this instead of the half-million coming into the city." 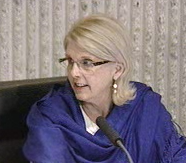 Leece said the number should have been in the Charter and disagreed with Dickson's characterization of the 2010 meeting. Dickson said he appreciated Valantine's concern about favoritism, fraud and corruption. Valantine said that Newport Beach and Irvine have specific numbers in the charter. Huntington Beach has no dollar amount but it can be established by ordinance. Righeimer's charter says the number can be established by ordinance or resolution. In the case of using a resolution, it is not subject to a referendum and could happen between Friday and Monday - not in a public meeting. Steve Ray posed question 6 - a look into the future. What will the city look like? What will the opinion of the charter be? Leece referred to city founder Bob Wilson's book about a man who threw tomatoes at people who disagreed with him. She, as a teacher, expressed disappointment for the current divisive conditions in Costa Mesa. She described missed opportunities and lots of legal expenses that probably could have been avoided. She recommended a NO vote on Measure V and a Yes for Sandra Genis, John Stephens and Harold Weitzberg. Righeimer said that in 20 years we WILL have a charter. "If it doesn't pass we'll just do it again. It will make no difference if we have 20 meetings with everybody holding hands singing Kumbaya - It will get passed." Valantine said he was not sure we had to go out 20 years. "The city is 60 years old and I've been here for 40. The last two years have been the most tumultuous I've seen". He then addressed the real reasons for our financial distress - the economy tanked and the CalPERS numbers suffered. He said that he's afraid he "will look back on this period as the most angry, vicious time in the history of the city." He referred to bright lights - Fire Chief Tom Arnold's restructuring plan, the Orange County Fire Authority review of our operations, increased pension contributions and new pension tiers. In rebuttal Leece mentioned the $240 million in unfunded pension liability, indicating it was not a bill we have to pay today - that it's spread out over decades. Righeimer said it's a "real debt". Valantine said he'd like to look back at good things that had been done. He'd like to see that it took a couple years to create a good charter. Dickson said he'd like to see this charter pass because it will save us money. Dickson thanks the hosts for an informative debate. He again mentioned his "emancipation from Sacramento", that the charter is a strong document and that it retains 60% of the protections we get from general law. Valantine said that the proponents would have us believe the charter takes power from Sacramento and gives it to the people. It gives power to the council. A wiser choice is to not adopt a flawed charter - a blank check. He suggested we discuss it and study it through an elected citizen's commission. Righeimer said it's important that we have our own constitution. He again mentioned that "half-million dollars", prevailing wage and being under the thumb of Sacramento. He then said something he mentioned earlier - "Perfect is the enemy of the good". (We suppose he's implying that those opposed to HIS charter are looking for perfection. I don't believe that's the case. I believe they are looking for a solid, carefully-crafted document that serves the needs of the community, not just the personal political agenda of one man) He closed by saying it's all about the prevailing wage. Leece closed by saying that she's not voting for the charter because it's a weak charter and far from the best we can do. It lacked true community involvement. She reiterated that our financial house is in order and we're seeing more cost savings every day. She emphasized that the future is bright for Costa Mesa, but this charter has too many flaws. I can"t imagine a charter that can only come up for review once every ten years. Unacceptable. Also, the fact that there is no citizen input is unacceptable. And, I don"t care how he denies it , the ability for no bid contracts is there. And he is aware of it. Developer money is already piling in for favoritism. (See Smith Family Trust (developers) of Newport Beach) and more. All of them from out of town looking for their buddy to take care of them. Righeimer is dismissive of 'trucks and stuff' but those cost millions, and once gone, we cannot replace them easily. We see that with the loss of our helicopter. I am voting for 1, 2, 3, and NO ON 'V'. We caught the last half and thought Wendy Leece and Perry Valantine did very well. Leece and Valantine sound like longtime residents who sincerely care about Costa Mesa. Righeimer sounds like a carnival barker just off the train from his last town and ready to move on to the next. Dickson's just an echo chamber for his master. In the case of using a resolution, it is not subject to a referendum and could happen between Friday and Monday - not in a public meeting. That's the biggest red flag out of 16 in this charter. I pointed this out to Frank Mickadeit and his silence confirmed the point. No law stops any three council members from setting contracting levels by themselves. I also got a good laugh about "Captain Ahab's" point about half a million. The law is quite clear. Money equals free speech. That's about as conservative of a principle as you can get in American government. Can't he please be consistent? What kind of conservative is he if he doesn't understand that? Geoff - This is a good recap (I listened to the broadcast). What cannot be conveyed in writing was Righeimer's growing agitation. Perry Valantine's calm use of facts to rebut Righeimer's false assertions were getting to him. But I see here, what I didn't hear last night - Righeimer's shifting of position from start to finish. It's about unions, no,it's about outside money (which wasn't here until HE started the charter mess), it was about local control,no, it was about prevailing wage. This is similar to the PR arc he started with a year ago. We were broke and falling off a cliff, no we are fine, we are besieged by greedy employes, no they are the best, we will die without pension reform, not it's just the prevailing wage. He is the human equivalent of a sidewinder snake. 2) Why is campaign money from your opposition bad but the money flooding in from contractors, trade groups and the OCGOP just fine and dandy? 3) You claim the anti-charter forces spread fear. What do you call your lies? As soon as your myths are debunked you look for another skeleton in the closet (couldn't resist the Halloween allusion)to scare us into submission. 4) If it isn't about union busting, why did you repeat several times, "On November 7 we will outsource everything."? 5) You have run the tape about running the city as a business so often it's wearing thin, but, a good business man and negotiator knows when he has his opponent on the ropes. The associations have ALL come to the table with reforms. They know the position they are in and have willingly made changes. Can more be made? We won't know if we don't continue the discussions/negotiations. Our workers have skin in the game and something to lose, so they are the best entity with which to bargain. Outside contractors are neither stupid nor altruistic. They cannot lose what they never had. They know we have a council majority that will jump at a contract in order to wrest the service from city workers. That gives the contractors the upper hand and weakens the reasoning of the buyer and the buyer's negotiating power. So, how is this being run like a business? Leverage your strengths, not weaknesses. I think Harold Weitzberg put it succinctly, "If in doubt, vote it out." There is a lot of doubt here. Over and OUT. Hypocritically, ironically or just simple deceit Dickson and other pro-riggy-charter people keep claiming they are putting the residents back in control. Yet they refuse to allow a committee of the residents create the charter. Dickson, this council and others already have exhibit and have shown us how they will rule if this passes. They will make the decisions for the residents claiming the residents are in control when in fact they will not as they have shown listen to the residents and will act on their own. It's hypocrisy at it's best or worst really. 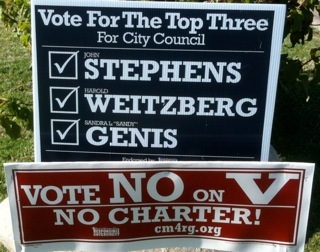 Vote this charter down and let's do one that really serves the citizens of Costa Mesa. The most outrageous lie was that everything not spelled out in the charter is left to state law. We pleaded with the Council to include that very provision in the charter. Righeimer's response was, "We're not going to do that." No reason was given. Further, THIS charter is NOT all about money; that's the hook to catch the unwary voter. It's all about POWER. With this proposed charter, the Council majority takes away protections that state law gives citizens and arrogates power to itself. "Power tends to corrupt; absolute power corrupts absolutely." The more power is concentrated in fewer people, the more corrupt and harmful its possessors become. Geoff, why don't you link to the actual audio so your readers can see for themselves the gaping holes and omissions in your recap. Well, Costa Mesa, are you sound asleep? He’s gonna bankrupt the whole damn town. Smell’s gonna make us sick. And it’s one, two, three, what’s this measure V? It’s just a Righeimer scam. Truck all the money away. V is for valueless vote-getting swarf. No wonder he says we’re broke. For doin’ arithmetic or readin’ the news. Will vote this charter down. Yes, V IS for barf. "B" is for vomit. Mr. Righeimer has repeatedly demonstrated in council and in public statements that he is arithmetically challenged. Example: thirty-five changes in Newport's charter, rather than thirty-eight. Many others abound, such as his rejection of a balanced budget in favor of his own scheme of setting money aside to buy motels. But removing his shoes, in addition to gassing us out with the smell of unwashed feet, only extends his numeric range to twenty, not thirty-eight. Additionally, it is my not-so-humble opinion that anybody dumb enough to pay three bucks for a diet coke entirely lacks the fiscal and fiduciary responsibility that ought to be required in a garbage collector, let alone a city councilman. Citizens, vote early and often! I intend to vote as often as I possibly can. 1,2,3, and NO on V.
Geoff's take is accurate. I don't think Wendy and Perry were adequately nasty to the proponents of this insanity. Riggy's trademark "Now, listen" is something he needs to be called down on. Riggy needs to go home, based on his promise to do it again and again. These boys are going down to defeat along with their bogus charter. Riggy will just hang with his buddies down in Newport and think up some new ways to screw Costa Mesa. local government closest to the people is best. we can elect or recall locals. can't do anything about union controlles sacramento. that is whi i am voting yes on v. also 3Ms. yep. Local government closest to the people is best. The residents! Not Czar Righeimer! Thats why I'm voting No on V, and 1,2,3. And so are enough to send that charter down the sewer where it belongs.